Rock’s pre-eminent saxophonist as a solo artist (as opposed to a sessionist) who came along at the tail end of the sax instrumental peak but who wound up being the defining figure of that movement. In addition it was McNeely who pushed the boundaries of the flamboyant stage show in rock and capitalized on his live reputation to propel his career to stardom. 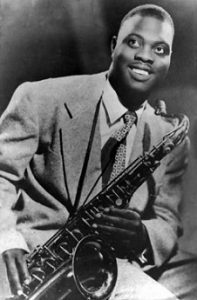 Cecil J. McNeely was born in Watts in 1927, making him just twenty years of age when rock ‘n’ roll came into being, winning an amateur contest held at Johnny Otis’s Barrelhouse Club in late 1948 where his unhinged style was already drawing notice. Soon he joined Otis’s band for a brief spell, recording with his outfit on a number of sides, and at the same time signed his first contract with Savoy Records to record under his own name – or rather the name company president Herman Lubinsky bestowed upon him: Big Jay. It was there that his first two releases were both national hits, the second of which topped the charts. Unlike older established sax players who’d made the move from jazz to rock out of commercial necessity and often looked down upon the style they were required to adapt in order to appease the fervent rock fan, McNeely felt no such conflict. He was born a rocker and backed by his older brother Bob who’d given Jay his first saxophone and now played baritone in his band, the McNeelys formed the most explosive pair of horn players on the scene in the late 1940’s and early 1950’s. McNeely gained a deserved reputation as the premier honker and squealer in tenor sax’s glory days, in fact his somewhat derisive nickname (much like “Elvis The Pelvis” in later years) was Big Jay McSquealy, but his records were far more diverse than almost all of his competitors, showing impressive compositional skills and a willingness to experiment in ways that paid off aesthetically on a consistent basis, including providing the means for which future luminary vocalist Jesse Belvin got his first exposure singing on one of McNeely’s tracks. But Big Jay’s main draw was always his outrageous live performances highlighted by his fervent energy and relentless attack on the horn, famed for playing endless one-note riffs that put audiences in a religious-like trance and pulling out all of the stops as a showman, including laying on his back while playing with his feet in the air, using fluorescent paint on his horn to be seen when the lights went out and, most famously, parading through the audience, sometimes out in the street and once all the way to jail in the back of a paddy wagon when he was arrested for just such a display. By the mid-1950’s the saxophone was just as ubiquitous as ever in rock, except now the best horn players were enlisted to anonymous back singers in the studio and on stage. McNeely, who’d had unrivaled solo success over the years, largely resisted that, although he always carried vocalists with him on the road and in 1959 scored his only pop hit with singer Little Sonny Warner on the original version of “There Is Something on Your Mind” which Bobby Marchan made an even bigger hit not long after. But it was to be McNeely’s final moment in the spotlight as a current artist. The torrid style of the sax, both on record and on stage, gave way to other developments in rock in the 1960’s as he put his sax back on the shelf and took a job in the postal service. But of all of the horn players of rock’s first golden age McNeely was virtually the last man standing, as he came out of retirement in later years playing well-received shows even as he hit 90 years old with new records coming out periodically to remind one and all of his importance in rock’s rise and subsequent takeover of popular culture. When he died in September 2018 McNeely was one of the final links to rock’s birth, not to mention one of its greatest and most influential artists of any era.